African American Wigs have the look and feel of hair that is natural to women of color. The texture of these wigs differs from other wigs as they have a more coarse texture and offer a wider range of darker colors to choose from. By your request, these wigs are specifically made for black women. We love the textures, curls, braids and layers of these fun and fabulous styles! At Headcovers, we believe that all women deserve wigs that match the texture and shade of their natural locks. Our curation of wigs especially for black women offers a wide range of darker colors to choose from - all in lively silhouettes. We’ve got long, medium, and short wigs for black women in a variety of realistic textures, from springy curls to loose waves. Whether you’re shopping for fun or functional reasons (or both), find your next favorite head of hair in our selection of wigs for African American women. 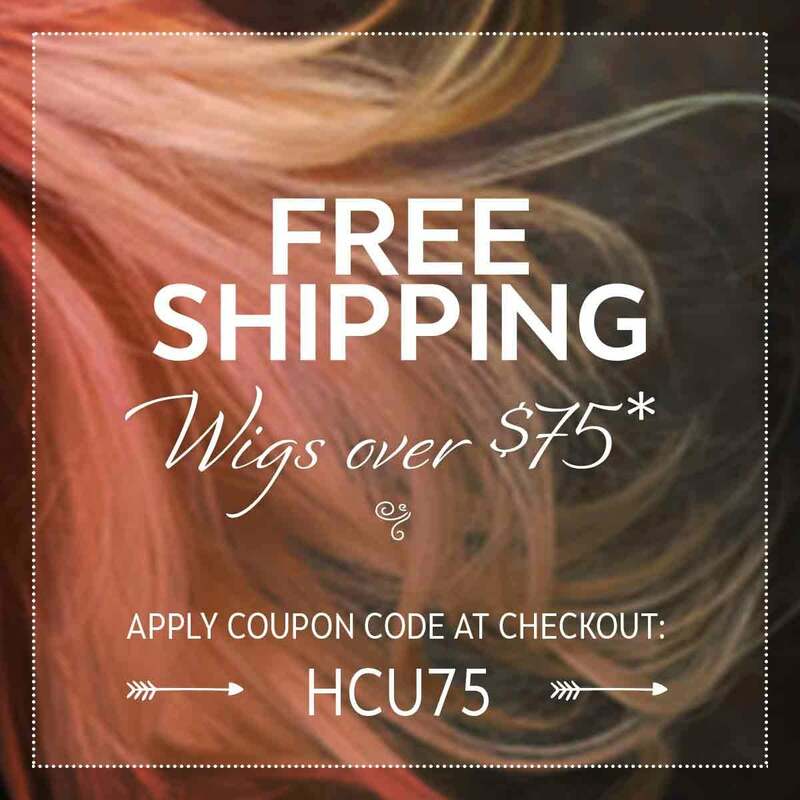 Shopping for wigs online can feel overwhelming if you’re not sure what to look for. A great place to start is determining what material you want your wig to be made out of. We offer human hair wigs for black women, as well as Remy human hair, synthetic hair, and heat friendly synthetic hair. While synthetic is the easiest to take care of, real hair offers coverage that is virtually indistinguishable to the wearer as well as the observer. Check out our Synthetic Hair vs. Human Hair guide for more help figuring out which material will best fit your lifestyle, budget, and needs. Which Silhouette will Flatter Your Face? Even though choosing a wig isn’t rocket science, finding a flattering wig is akin to getting a good haircut. The key is to identify the shape of your face; after that, it’s all about geometry. To determine this, we recommend tracing the outline of your face with soap or lipstick while standing in front of the mirror. Then, head over to our Wig Hairstyle Guide for Different Face Shapes to learn which wig types you’re most compatible with. Even though it may seem limiting to only select a wig that matches your particular shape, it can actually be a relief to help narrow down your options. Once you know what silhouette you’re looking for, you’ll be free to focus on other aesthetic decisions. Taking good care of your African American wig will maximize its lifespan. How you go about doing this depends on if you purchase a synthetic or human hair wig. Synthetic are the easiest to style because all you have to do is spritz with a bit of water and go. Wash your synthetic wig every 6-8 wearings. Human hair wigs are a little more involved; washing human hair wigs is necessary but shortens the lifespan of the wig, so we recommend using as few styling products as possible. If you’re planning on buying a wig with Headcovers online, we offer four ways to match your target color. If you’ve still got some strands on your head, send us a swatch in the mail. Our expert cosmetologist will match your natural color to whichever wig you’ve ordered. Another option is to send us a photo when you pre-order your wig so that we can contact you with our recommendations. If, on the other hand, you are a seasoned wig wearer and know exactly which shade to request, that works too; just let us know. Finally, for those who favor a human touch, our consultants are available over the phone to walk you through the color matching process. For any questions, concerns, complaints or musings, call us at 1-800-264-HATS (4287). The best accessory for any wig is confidence. Take some time in front of the mirror to get used to how you look in your new wig. Be patient with yourself, but realize that negative self talk isn’t constructive. If you’ve taken the time to research and thoughtfully consider what type of African American wig is best for you and your lifestyle, there’s no reason to be shy. Step out in style with one of our wigs for black women today.